Those awaiting results of April 2016 Real Estate Appraiser board exam can find here the list of passers, top 10 (topnotchers), top performing school and performance of schools as the Professional Regulation Commission (PRC) and the Board of Real Estate Service released results in six working days after the exam. PRC on Monday, April 18, announced that 1,271 out of 3,794 passed the Real Estate Appraiser Licensure Examination. The Real Estate Appraiser Licensure Examination was administered on Friday, April 8, in the cities of Manila, all Regional Offices and Zamboanga. Starting April 27, 2016, registration for the issuance of Professional Identification Card (ID) and Certificate of Registration will be done on-line. Please go to www.prc.gov.ph and follow instructions for initial registration. Those who will register are required to bring the following: duly accomplished Oath Form or Panunumpa ng Propesyonal, current Community Tax Certificate (cedula), 1 piece passport size picture (colored with white background and complete name tag), 2 sets of documentary stamps and 1 short brown envelope with name and profession. The one-day exam covered the fundamentals of real estate appraisal and professional appraisal practice. 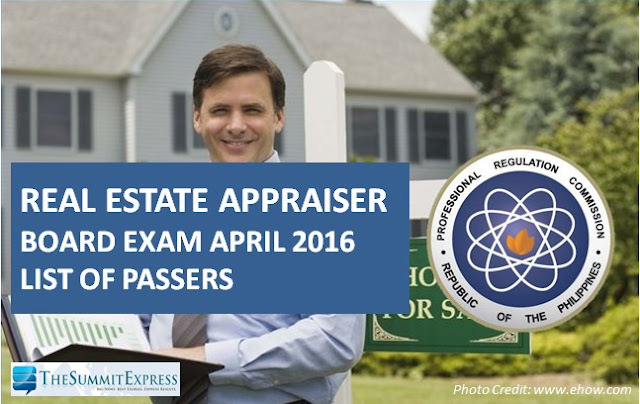 The results of the April 2016 Real Estate Appraiser board exam are expected to be released within 5 working days after the exam or until April 15, 2016. For August 2016 schedule of exam, PRC said through Resolution No. 2015-948 that exam results are target for release in 5 working days. In August last year, official results were announced after five working days. 2,462 out of 4,731 passed the examinations.